Thanks to this service which gives tailored support to students with mental-health issues, allowing them to gain access to, participate in and complete Higher Education, participating students are able to reach comparable outcomes as their peers. London Borough of Hackney has a high prevalence of mental health conditions in the population. There are also significant pockets of multiple deprivation. The aim of the service is to recruit and support students with mental health conditions through further education and beyond. The service advocates on behalf of students and is student led, the students set their own goals and support is tailored towards each on a case by case basis. Examples of support include, referring students to the college’s Additional Learning Support & Inclusion Team for in class support, the college’s Student Welfare & Advice Team for benefit and housing related issues, and helping university or job applications. The service advocates and refers to appropriate services. It is not a mental health service, but an education service, there is no clinical role. To raise awareness about mental health and well-being in the organisation producing policy and procedures for tutors. Students are recruited through community mental health teams. Also there is tailored recruitment from mental health wards (people with severe and enduring mental health conditions) to specifically designed short courses based in hospital to give confidence. Discrete Mental Health literacy and numeracy courses have been designed as a stepping stone available on campus. Specific Mental Health Cookery Course is co-facilitated between the East London Foundation Trust (Mental Health) and Hackney Community College with the longer term aim of getting them off the ward and into mainstream college courses. In the past two years the service has seen an increase in demand from younger students referred through Children and Adolescent Mental Health services and those from the mainstream student population under increased pressure from social disadvantage that impacts on mental health as low mood or self- harming. The intervention is in partnership with a mental health trust so it is part of a more holistic approach. To identify and address barriers to learning for people with mental health needs. To facilitate access, support and progression to mental health service users who are currently studying or thinking about returning to education and training or employment. To provide in-depth one-to-one advice, guidance, and support to mental health service users to engage in education, training and employment. To challenge stigma. To support, advise and raise awareness around mental health issues among college staff. To liaise with key College staff to ensure appropriate, flexible provision is developed and delivered to meet the needs of mental health service users at college and within community and NHS venues. The key driver is local need. It is recognised that people with mental health support needs are excluded from many services and aspects of society, including further education. 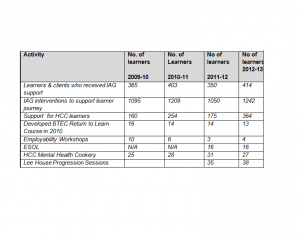 In this college's local area, the most common reasons for being in receipt of incapacity benefits for both genders is mental, emotional and behavioural health with almost half (46%) of claimants suffering from these illnesses. This is 11% higher than the neighbouring boroughs’ average. 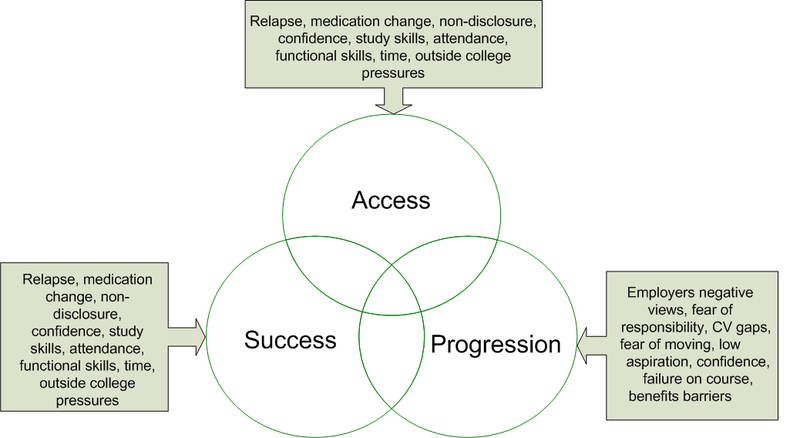 The diagram below illustrates the three main stages in stages in a learner’s journey, access to education, success and progression and notes some specific barriers experienced by this group of people. A key additional barrier at each stage is that a learner or prospective learner may be staying within a hospital or secure unit. This is addressed and supported by professionals through the learner journey. 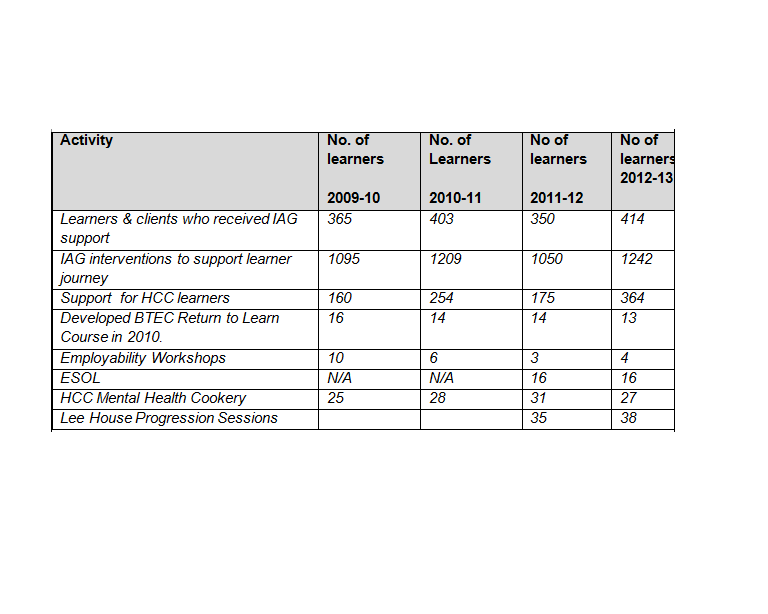 95% of learners referred from mental health services have long term enduring mental health conditions. There are strong partnership arrangements and risk assessment procedures in place for forensic referrals. There is high political support in that the benefit claimant count for people with mental health conditions is very high. This initiative aims to support people into training and then work and thus can reduce the benefits dependency of people with mental health conditions. 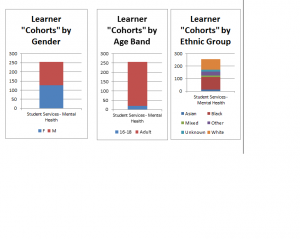 The college management had identified the unmet mental health needs of the existing student population as a priority. The key factor to the success of this initiative has been the partnership. There is a steering group of senior managers from the Mental Health Trust, the Public Health Department of the Council and two from the College. A particular characteristic of the excellence of the Service is the collaborative working partnership approach of the funders, the College and key organisations working with mental health service users in the borough. Trust and strong partnerships have increased the number of referrals from clinical and community organisations over the duration of the project. The Service works with learners and potential learners with mental health needs ranging from mild to moderate to severe and enduring. The Service consequently offers a number of assessments to meet the different needs of the client group. Each individual is offered impartial information, advice and guidance on education, training and employment opportunities to meet their unique needs and goals. Forensic service assessments. People referred to the service by the local forensic mental health team have detailed assessments due to the complex needs of the individuals and their situation. The current process includes a multi-disciplinary and multi-agency team agreeing to the College referral, which often includes security clearance. Education Success Plan. This maximises the wellbeing of service users entering College and supports the College in engaging with the service users. It is a consistent system for holding and sharing information about Forensic Service users attending course at the College. Skills action plan. This is negotiated and completed with each individual to identify previous experience, future goals and support needs (including self esteem, confidence, time keeping, staff/student interactions and travel) and possible impacts of their health and medication on attendance and learning. 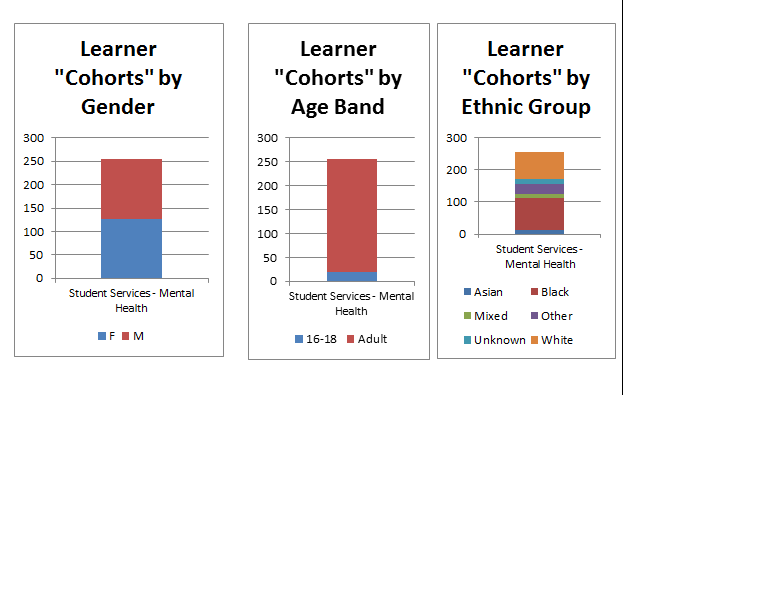 The plan is updated as goals are met and needs change throughout the learning journey. The purpose of this assessment is to establish what risk factors may influence this learner’s success in getting the most out of the experience at College and to put in place controls to minimise these risks. Service users are asked to consent to this information being recorded and shared with their College tutor and relevant lecturers. If during or after these processes a learner needs more time to consider accessing education, future meetings are arranged. After the initial assessment of learners, ongoing guidance and support is in place throughout their college experience, involving ongoing liaison between the tutor and clinical team to ensure appropriate support remains place for the learner. · needs and support are discussed around work load, return to class, submitting assignments etc. · meetings with the learner if required on a weekly basis during first few weeks of re-engagement with the course. 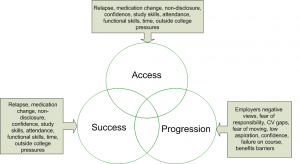 · Courses provide an opportunity for inpatients to leave hospital wards and have another focus in their lives. Inpatients are escorted to classes and supported by an occupational therapist. - Pottery classes at the Centre for Mental Health at the local hospital for inpatients and outpatients, and at a local rehabilitation centre. The tutor also teaches classes at the College which enables a smooth progression route for learners. - Computers for Beginners, ESOL, Read, Write & Spell at a local rehabilitation centre. - Cookery course, funded by the local Foundation Trust NHS, delivered on campus three times a year. - BTEC Workskills Return to Learn course, taught on campus (three times a year) by a College mental health adviser who is a qualified teacher. This is also funded by the local Foundation Trust NHS. - Employability Workshops on campus. · Mental health service users are also encouraged to join mainstream courses, with support, where this is appropriate to their individual circumstances and needs. The Service currently supports learners on courses across mainstream curriculum: ESOL, Art & Design, Construction, IT, Sports & Leisure, Adult Recreation, Teacher Training, Literacy & Numeracy and Catering. · Holistic approach to support in collaboration with mental health agencies. The service is growing continually and there is an increasing focus on student knowledge with a Student Voice Forum coproducing elements of the service. A threat to the sustainability of the service is education funding cuts and benefits generally. If students cannot afford the fees or are not entitled or have benefits problems then we cannot support them. The service costs £85,000 per annum which funds two posts and on costs. 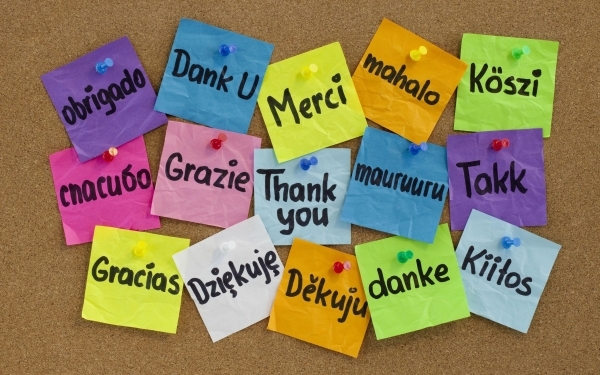 · "Participants identified different entry routes to the project and gave favourable comments about the support they received"
· Learners "appreciated support and encouragement and a familiar face at college" and "college tutors and other learners were also described as helpful and supportive." · "As a result of the support (the learner) had received and his educational experience, he has been discharged and now has an occupational role". · A refugee with severe mental health problems "was able to enter the college and develop occupational skills"
· The College is described as "an essential cornerstone of community services for mental health service users"
The retention rate was 88%, against the College's retention rate of 87%. The achievement rate was 72% against the College's achievement rate of 73%. These figures show a great success in a group that was previously under-represented and would otherwise be at great risk of underachieving. · 18 wanted to progress to work; when surveyed, 12 had already found work.